G, C, A, T to be exact. Only a slight stretch of our DNA make the difference between us and our chimpanzee cousins. When embedding the bit of genetic information into mice, scientists found that the rodents’ brains grew significantly larger than usual. “It’s likely to be one of many DNA regions that’s critical for controlling how the human brain develops,” says Debra Silver, on the region they chose. Silver is a neurobiologist at Duke University Medical School. It is likely that this accounts for the massive difference in brain size between humans and our closest living relative, the chimpanzee – a difference of anywhere between two and four times larger by current estimates. While also having larger brains, people also have many more neurons than their simian friends, and many more connections, or synapses, occurring between each. Scientists have long sought to determine what genetic basis we have for abstract thought as well as valuing logic and complex emotions – our capacity to develop languages and artwork, concepts that have long been associated with larger brain size. Currently, we have a wealth of evidence that our fellow hominids the Neanderthals were also capable of artwork and tool making, presenting a rather different picture than our old stereotypes of mindless barbarians. The Human Genome Project, concluded in 2004, revealed that humans and chimpanzees have DNA approximately 95 percent identical, establishing that we have more in common with chimps than mice do with rats. Silver’s latest interest, however, is to learn more about those regions in the genome that differ. 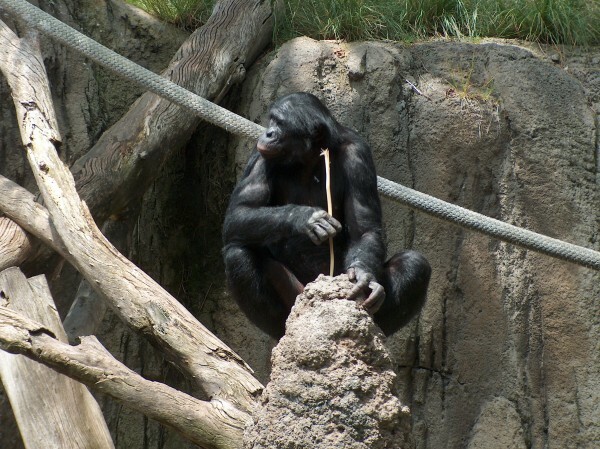 Chimps do have capacity for tool making, using straw to catch termites, but their linguistic capacity, aside from facial reading, is still being explored. Silver and her researchers isolated a gene that aids in brain development and removed the DNA region near it, which they proceeded to plant into mice. One group received human DNA, and the other received DNA extracted from chimps. “What we discovered is that the human DNA turned on gene activity in neural stem cells, and these are cells which produce the neurons of our cerebral cortex,” said Silver. The mice that were born yielded brains 12 percent larger than the brains of mice who received chimp DNA. The findings were published in Current Biology. Now, Silver’s team will begin an investigation of how differently mice with larger brains will behave as they mature, knowing that they have only begun to scratch the surface. At the same time, they are looking for other genes that are specific to humans. Of particular interest is within a vestigial genetic region known popularly as “junk DNA,” that which evidences our common descent from other, more primitive lifeforms, but until recently was believed to serve no specific purpose of its own, since this region doesn’t code for any active proteins in the body. Currently, however, researchers suspect that this region is critical for turning on and off genes as new cells are formed. Their ultimate function, if any at all, still remains a mystery. “We have very little scientific information about the actual functions of those regions,” said Katie Pollard, who researches human and chimp DNA from the University of California, San Francisco, in a recent interview with NPR. Many of the ways in which we differ from chimps can be found within the junk DNA, and many researchers like Pollard are still looking to meet that gap. As impressive as the results reported in the study may have been, it is difficult to predict what effect it may have on the mice. It’s preferential to see directly how either people or chimps are affected by the region’s presence, but then the research touches on ethical grounds. Challenging, sure, but not necessarily impossible either. Already, Pollard and her colleagues are experimenting with lab cultivated cells from chimps and humans, raised in Petri dishes. As their work progresses, the team hopes that soon they may find specific sequences in the DNA that are human by their very definition – opening the gateway of questioning precisely what characteristics make us human, and how distinct we really are from our living primate relatives. The difference may be far less than we ever imagined.